SB 829 (as amended) Senator Scott Wiener’s Cannabis: compassion care license. “(1) The Control, Regulate and Tax Adult Use of Marijuana Act of 2016 (AUMA), an initiative measure approved as Proposition 64 at the November 8, 2016, statewide general election, authorizes a person who obtains a state license under AUMA to engage in commercial adult-use cannabis activity pursuant to that license and applicable local ordinances. The Medicinal and Adult-Use Cannabis Regulation and Safety Act (MAUCRSA), among other things, consolidates the licensure and regulation of commercial medicinal and adult-use cannabis activities. This bill would establish a compassion care license under the act issued to an M-licensee who, for no consideration, donates medicinal cannabis, or medicinal cannabis products, to qualified medicinal cannabis patients who possess a physician’s recommendation. The bill would require the Bureau of Cannabis Control to issue and regulate the compassion care licenses. (2) Existing sales and use tax laws impose a tax on retailers measured by the gross receipts from the sale of tangible personal property sold at retail in this state, or on the storage, use, or other consumption in this state of tangible personal property purchased from a retailer for storage, use, or other consumption in this state. Those laws provide various exemptions from those taxes. This bill, on and after January 1, 2019, would exempt from those taxes the gross receipts from the sale in this state of, and the storage, use, or other consumption in this state of, medicinal cannabis or medicinal cannabis products that will be donated, for no consideration, to a compassion care licensee. (3) The Bradley-Burns Uniform Local Sales and Use Tax Law authorizes counties and cities to impose local sales and use taxes in conformity with the Sales and Use Tax Law, and existing laws authorize districts, as specified, to impose transactions and use taxes in accordance with the Transactions and Use Tax Law, which generally conforms to the Sales and Use Tax Law. Amendments to the Sales and Use Tax Law are automatically incorporated into the local tax laws. The bill would require that these provisions not be construed to impose an excise tax upon medicinal cannabis, or medicinal cannabis products, donated for no consideration to a compassion care licensee, as defined. This bill would redefine entering the commercial market to mean cannabis or cannabis products intended for sale, in any manner or by any means whatsoever, for consideration. The bill would require that the cultivation tax not be construed to be imposed upon medicinal cannabis, or medicinal cannabis products, donated for no consideration by a cultivator to a compassion care licensee or to a cannabis retailer for subsequent donation to a compassion care licensee. (6) The Control, Regulate and Tax Adult Use of Marijuana Act, an initiative measure, authorizes the Legislature to amend the act to further the purposes and intent of the act with a 2/3 vote of the membership of both houses of the Legislature, except as provided. 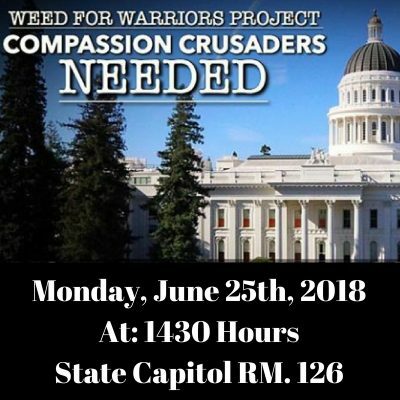 Who Is The California Compassion Coalition? One battle has been won but we have many more to go. SB 829 was voted out of the Committee on Business and Professions, on Monday. It passed with and 11-1 vote. Next, we move onto the Committee on Revenue and Taxation and WE NEED ALL HANDS ON DECK. An applicant shall submit to the Bureau, with the application, a complete and detailed diagram of the proposed premises. The diagram shall show the boundaries of the property and the proposed premises to be licensed, showing all boundaries, dimensions, entrances and exits, interior partitions, walls, rooms, windows, doorways, and common or shared entryways, and shall include a brief statement or description of the principal activity to be conducted therein. The diagram shall show and identify commercial cannabis activities that will take place in each area of the premises, and identify limited-access areas. The diagram shall show where all cameras are located and assign a number to each camera for identification purposes. The diagram shall be to scale. The diagram shall not contain any highlighting and the markings on the diagram shall be in black and white print. If the proposed premises consists of only a portion of a property, the diagram must be labeled indicating which part of the property is the proposed premises and what the remaining property is used for. If the proposed premises will be a microbusiness, in addition to the requirements of subsections (b) through (g), the diagram must also include measurements of the planned canopy, including aggregate square footage and individual square footage of separate cultivation areas, if any. Authority: Section 26013, Business and Professions Code. Reference: Section 26051.5, Business and Professions Code. The Governor of Vermont vetoed legislation to legalize cannabis in the state. He stated that he was not philosophically opposed to the idea of legalization however, he wanted to see increased penalties for selling to minors, driving while under the influence of cannabis and an increased commitment to develop taxes and regulations. These themes, along with product safety, are part and parcel to discussions in all states that have legalized cannabis, whether medical or adult use. These issues will continue until the public is comfortable with how the cannabis products are handled, consumers are protected and the public safety is reasonably assured. I want to state clearly that cannabis is not benign. Consumers can have unwelcome reactions to its use. Drivers can have their ability to operate a vehicle, or engage in other dangerous activities, impaired. Use by children is concerning to many policy makers and citizens. Taxing and regulating an illicit market will not be easy or happen quickly. However, these challenges are being overcome in several states and more will follow. Consumer safety is being addressed in many ways. Creating a safe supply chain begins with regulations that control the growing, processing ,transportation, manufacturing, testing, storing, packaging and retail sales. Along the supply chain there are many places and ways to raise money for state and local governments to oversee and enforce the regulations. There are also taxes being imposed that are raising millions, and eventually billions, of dollars in revenue to benefit states and local jurisdictions in many ways. Ensuring that cannabis and its products are safe, requires testing for contaminants including mold, mildew, toxins, heavy metals, solvents and pesticides. Failures of these tests will remove dangerous products from the supply chain and give some level of assurance to consumers.Testing for cannabinoids and terpenes will help educate consumers about their reactions to these different constituents of cannabis. Much is being made about overdoses from cannabis, especially edibles. Retail dispensers, knowing the cannabinoid and terpene profiles, will be in a position to teach cannabis naive consumers on how to consume without going overboard. For experienced consumers, knowledge will provide better understanding of what they are using and what to expect. With time, the public will get more comfortable knowing that it is impossible to take a lethal dose of cannabis. It can be concerning when more is consumed than desired, including children eating edibles, but with time the effects will pass. Poison control calls and trips to the emergence room will decrease as public knowledge increases on the overall safety of cannabis. Consuming and driving is an area creating public safety concerns. No one wants impaired drivers on the roads, but determining impairment is not like dealing with alcohol. Cannabis is used through the lungs, under the tongue, through the gut, through the skin and by way of suppository. It can take from a few seconds to hours to enter the system and its effects can diminish to non impaired levels within a matter of minutes to hours. Unlike alcohol, it enters the fat system in the body and can slowly be metabolized over weeks. Law enforcement is looking for a portable testing device that can determine levels of active and inactive cannabinoids and laws are being passed to establish “per se” impairment levels of THC and its metabolites. However, science does not currently support per se impairment levels. THC, its active metabolite 11-OH-THC and the inactive metabolite THC-COOH can be present at significant levels hours or days after use, but actual impairment can diminish within minutes. Nevada has set a per se limit of 2 ng/ml in the blood, while Colorado is more common at 5 ng/ml. However, a recent Colorado trial resulted in an acquittal at 19 ng/ml. California has managed to keep any per se levels off the books, but millions are being directed to the CHP and major universities to carefully study how officers can determine in the field whether there is probable cause to believe impairment is present. Many jurisdictions allow cannabis to be transported in a vehicle, but consuming in a vehicle is problematic. Even if not impaired, the smell of burned cannabis will bring much unwanted law enforcement attention. Don’t smoke in a vehicle and certainly not while driving. Passengers smoking can also be a problem. Best advice is to treat cannabis like an open container and store it securely where a driver can’t get ahold of it. Don’t break more than one law at a time is what I drilled into my kids heads. Although the illicit market does not check ID’s, the regulated industry will. Selling to underaged people will carry serious criminal consequences. With a physician involved, minors are allowed to use cannabis for medical conditions. Recreational use is another thing altogether and policy makers and citizens do not want minors buying or using cannabis. Expect adult use states to have stiff penalties when it comes to minors. California lowered almost all cannabis criminal sanctions to legal, infractions or misdemeanors. Selling to minors remains a felony and the state will be looking for this. Don’t expect this to change soon so get used to it and don’t do it. I expect more states to put cannabis legalization on the ballot and more legislatures will be establishing regulated, legal cannabis markets. Legal states are gearing up to fight federal intervention should AG sessions move against legal cannabis at the state level. Legal cannabis is not going away and the states will be struggling for answers to the questions raised by Vermont’s governor, plus more. Cannabis consumption will be safer, but the regulations and taxes will be daunting. Keep kids out of the cannabis market. Although not benign, cannabis is relatively safe, non toxic and not poisonous. Do not drive after consuming until you are sure of the effects and expect more per se laws. As Tiger Woods found out mixing drugs can be a problem, so be very careful with using other drugs or alcohol. My family is out there on the roads and I want everyone home safe. Be a safe consumer and a good citizen.